I remember seeing it in the early 80s. I remember waiting anxiously for the 1967 version to open with only John Hench and Herb Ryman's renderings to comfort me. Only to find that they tore down the House of the Future. I WAS GOING TO LIVE IN THAT HOUSE!!! Tomorrowland looks so much better opened up. I really hope they move or remove Astro Orbiter. If they decide to open that bottleneck permanently, whatever that pile of crap is that is now visible from the hub would need to be addressed next. Looks like something they found at the local trash dump, and I remember thinking it looked terrible in person when I last visited. It makes Mission Breakout look like the Mona Lisa. Aaahhhh. Looks so much better. Like the McRib, it went away and is coming back again. And like the McRib, they re both $hit. Leave it gone... Remove the rocks... Tear out the orbitron and put the moonliner on top of the platform as a weenie. It's not the refurb we deserve but it would be better than what's there now. Tomorrowland honestly causes me legitimate sadness. A land originally designed to inspire young minds has turned into a constant reminder of past failures and what things could have been. Nothing will change until people stop visiting the land. That won't happen anytime soon because Space Mountain is far too popular. I mean technically the Rocket Rods are still under refurbishment. With newly enhanced visual effects, THX and digital sound and a few new surprises. 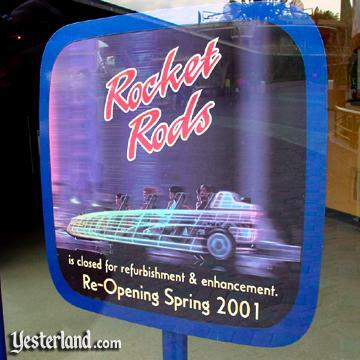 It’s unfortunate that I never got to experience the infamous Rocket Rods. Every time I went to DL they were closed. I personally don't see that very plausible. While it is likely HyperSpace Mountain will come back for a while, once the dust has settled I think Star Wars is going to slowly creep it's way out of Tomorrowland. If Astro Orbiter ever gets some kind of re-imagining, it will probably be along with the potential future Tomorrowland revamp. If this was true, Disney would’ve promoted it months ago on their Parks Blog and make it sound like it’s the next PoTC.